Features:This model's exceptional sound quality reduces background noise an average of 85% with it's Ambient Noise Reduction Technology and amplifies sounds up to 24 times to hear faint sounds you might otherwise miss. You can auscultate immediately, thanks to the instant-on technology. 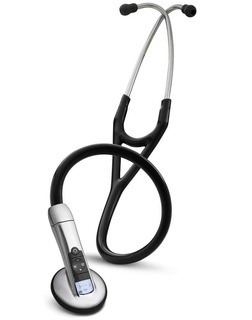 The power button quickly activates backlight for low light conditions and the stethoscope stays in battery-saving "sleep-mode" until you start your next auscultation. The backlight LCD display includes frequency selection, sound level, remaining battery life and your patient's heart rate.